Chelsea manager Jose Mourinho insists he is not concerned about the fact that key trio John Terry, Frank Lampard and Ashley Cole are all out of contract at the end of the season. "It's a situation that doesn't worry me or the club and, I think, doesn't worry the players," he said. "Their desire to play for this club, nobody has doubts about it. "Everything is very calm [and] at the end of the season, probably before that, the offer will be on the table." Lampard, who became Chelsea's record goalscorer towards the end of last season, was linked with a move away from the Blues before belatedly signing a one-year contact extension after chatting with Mourinho before the 50-year-old was approached to return to Stamford Bridge in June. 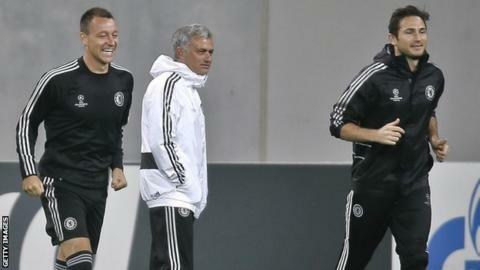 But Mourinho is confident the 35-year-old's contract situation will be more straightforward this time around. "Probably last season was more complicated," he added. "John was not playing, Lampard was almost signing a contract with LA Galaxy and he was not also feeling important in the team. "In this moment the situation is very, very clear. They trust the club, we trust the players. And, for sure, without conflict, the best decision for us and for them will be taken." About his conversation with Lampard, Mourinho added: "At that time I was Real Madrid manager, not Chelsea manager, and I gave my opinion. Just my opinion, as a friend at that time.